Have you ever been so angry about something that you can’t think of anything else but that one thing? Even if its been resolved? That’s me right now. I’m sitting here stewing and livid. I try not to have a lot of negative energy in life but our internet provider threw us for a loop yesterday and completely ruined our evening and wasted our time. I don’t like getting played! I know there are worse things that could happen in life and I know we should be thankful that we have internet. I get all that. It’s just hard when you’re in the moment to think of how lucky you are, which is why I’m writing this now – so I can reflect on this later and be grateful. 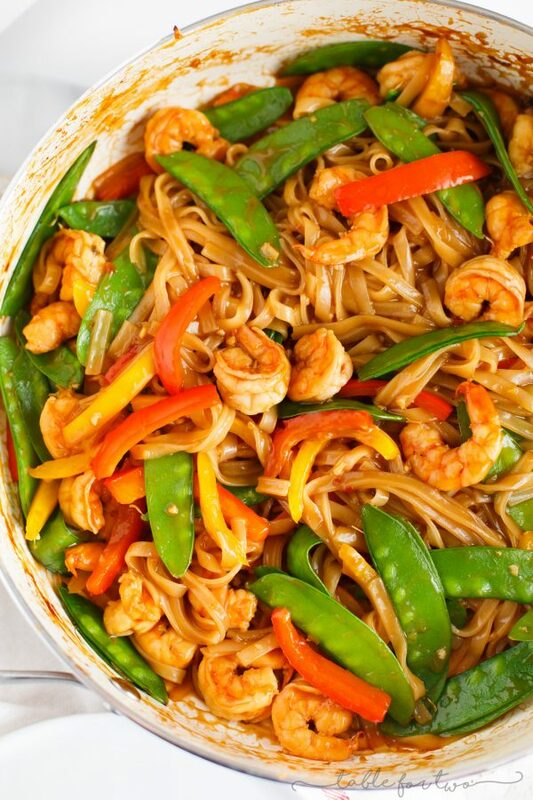 This noodle stir fry is PACKED with flavor. 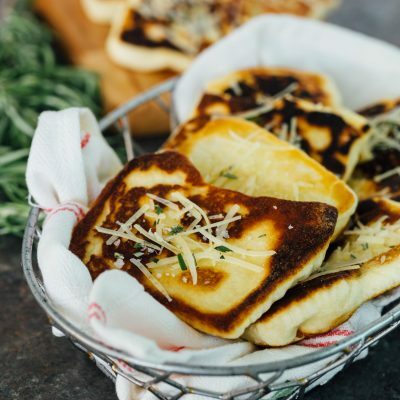 If you like some heat in your food, then you’ll love this dish BUT the beauty of making your own meals is the fact that you can tweak to what you like. If you don’t like heat, you can easily omit the heat in this dish but if you like a lot of heat, you can add a lot! It’s very versatile. 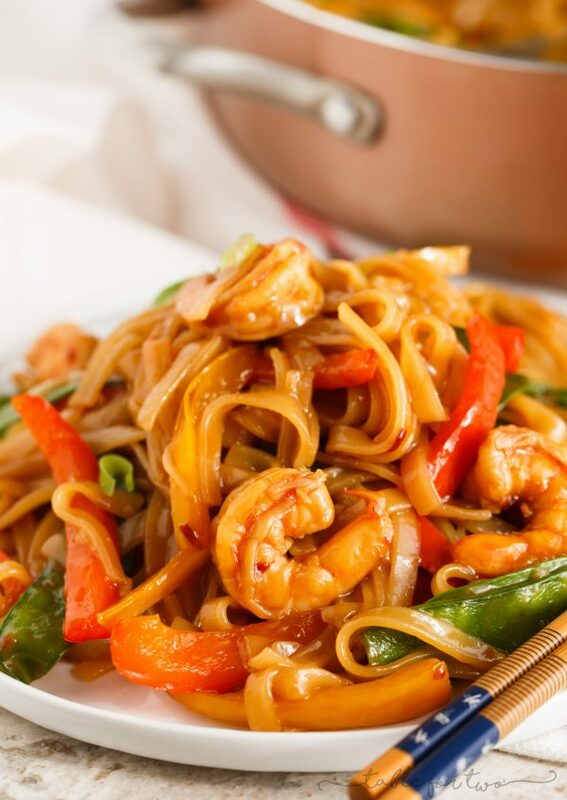 I love the thick sauce that coats the noodles and the shrimp sprinkled throughout. You’re gonna love this dinner if this is on your menu! Hold me. I’m going in! 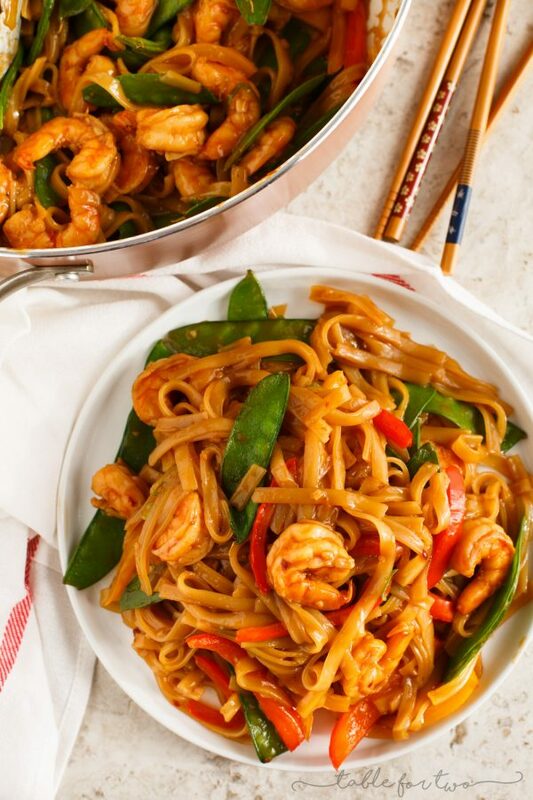 An easy and flavorful weeknight dish to satisfy your stir fry craving! 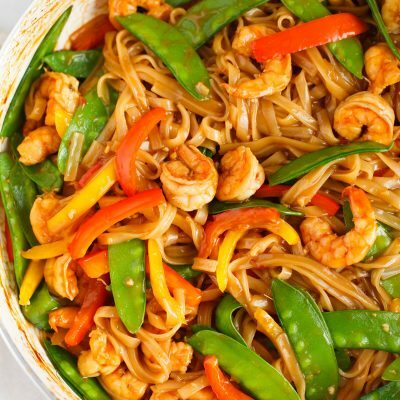 This ginger garlic shrimp noodle stir fry is packed with everything your tastebuds will love and they'll love you back! In a large measuring cup, add all the ingredients for the sauce and whisk together. Set aside. In a large skillet over medium-high heat, add vegetable oil. Once the oil is heated, add the bell peppers and sauté until softened. Add the sugar snap peas and cook until softened but still has a crunch, about 5 minutes. Add the shrimp and cook until pink and cooked through, about 5 minutes total. Add the cooked noodles then pour sauce over the entire dish. Bring sauce to a simmer and let thicken for 3-5 minutes. 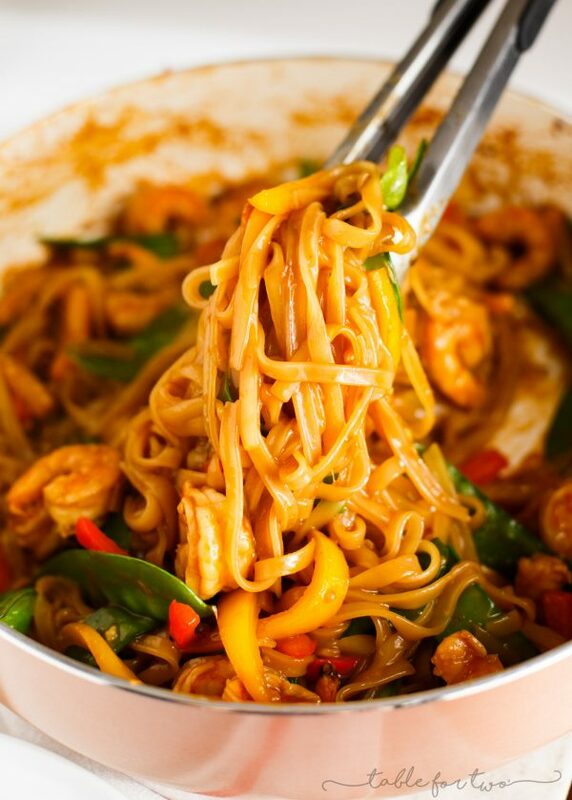 Continue tossing the noodles and ingredients until everything is nice and coated. Add more or less depending your desired heat level. Ok this dinner looks incredible!! Love!! Stir-frys are my fave! Yum, this was pretty much made for me I think! 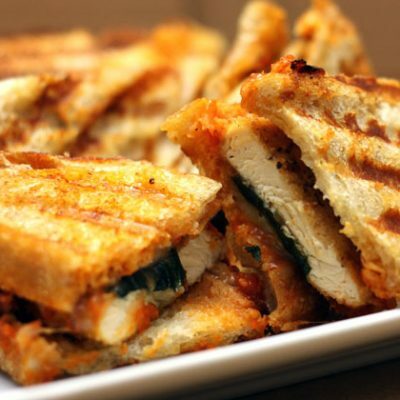 So nice and quick, easy and tasty! Love all all those vibrant and beautiful veggies! This looks amazing! I’ll have to try this! Nothing sounds better to me today, love this! I love this!!! making my stomach rumble!! Oh, this looks and sounds amazing! Made this tonight. It was great! Was really happy with how quick this came together. 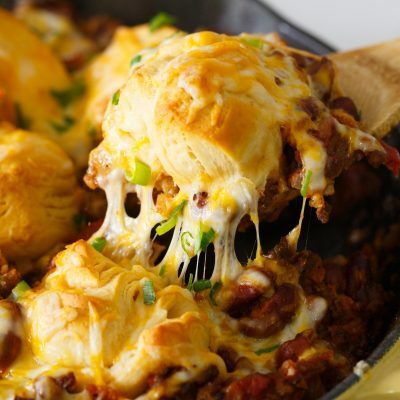 Really good weeknight meal! Awesome!! So glad you enjoyed this! Thank you for the feedback! Hi! I linked to it in the very last ingredient on the list. They’re stir-fry rice noodles. Made this for lunch today! Wowza! So good!